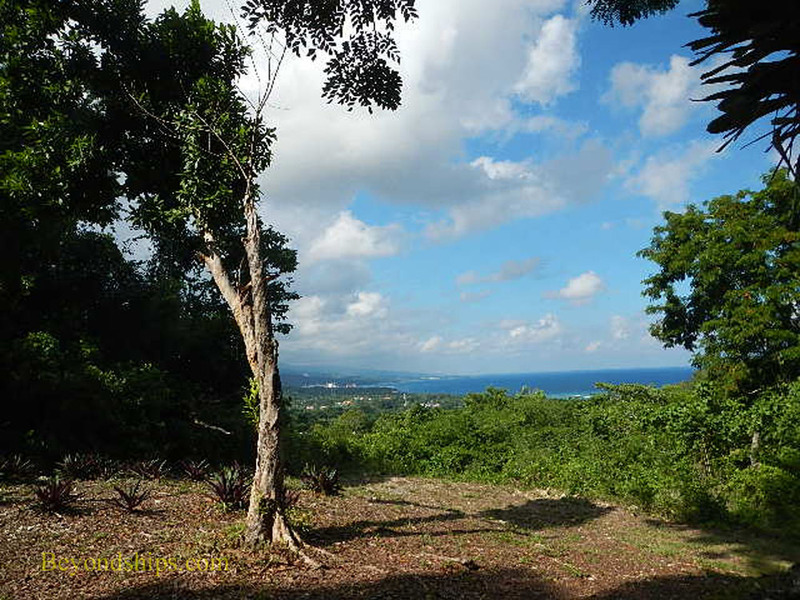 Prospect Plantation covers 1,000 acres on the hills a few miles east of Ocho Rios, Jamaica. It is no longer a working plantation but rather is a tourist destination offering a variety of activities including horseback riding, camel encounters and cooking classes as well as tours of the great house and grounds. The tour of the plantation is done in an open-air jitney wagon pulled by a tractor. With its corrugated metal roof and its bench seats, this is not the world's most luxurious vehicle. In addition, the frequent grinding of the gears and the tractor's occasional stalls while going uphill helped to explain why the owners required participants to sign a liability waiver before boarding. Still, the jitney managed to take everyone around the estate without incident. During our ride around the estate, the driver also acted as the guide. His commentary was upbeat and often amusing. He stopped the vehicle by various cultivated fields to show us some of the plants that had been grown on the estate when it was a working plantation such as bananas, cassava, sugarcane, coffee, and allspice. At one stop, our guide was joined by another man who gave a demonstration of how to climb a coconut tree. Upon returning to earth, the climber demonstrated how to slice open a coconut. Then he and our guide spoke about some of the plants indigenous to Jamaica while passing around samples. The high points of the tour were the views. 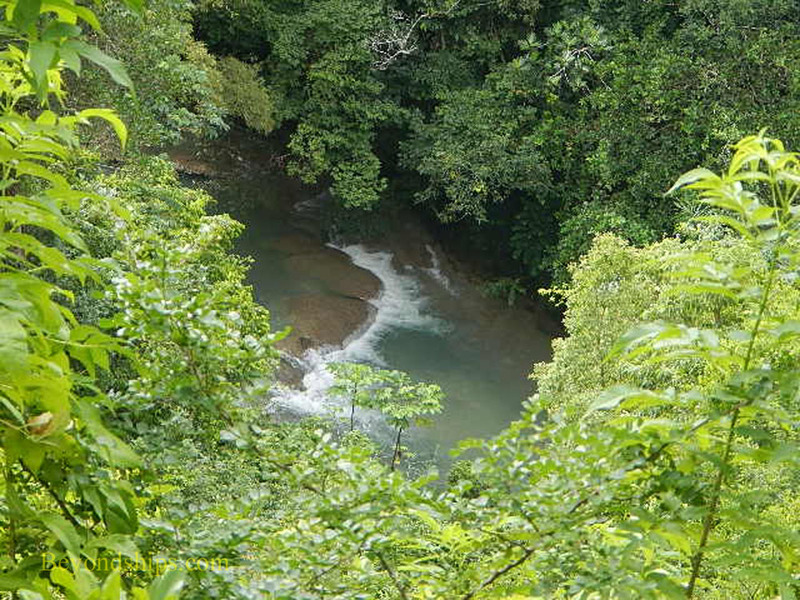 At White River Gorge, we stood high on a hill overlooking a rushing river, which cut through a lush valley. Then from Sir Harold's View, we could see the ocean as well as the surrounding tree-covered hills of the estate. Dating from the 18th century, the great house is relatively small compared to some of the great houses elsewhere in the Caribbean. It was purchased in 1936 by Sir Harold Mitchell, a British politician and international businessman. Among other things, Sir Harold served with Winston Churchill in the Conservative Party in the 1920s. Subsequently, Churchill planted a tree during a stay at Prospect Plantation. The interior of the great house contains antiques and artifacts collected during Sir Harold's time. The ground floor of the great house is open to view on the tour. However, during our visit, the veranda was being used for a Jamaican cooking class and that limited our ability to explore. Overall, while Prospect Plantation is not spectacular, it is pretty and the tour is interesting. Above: Specimens of various trees along the tour route are labeled to help visitors identify them. Below: An employee demonstrates how to climb a coconut palm. The high points of the tour were the views.